Apple and Samsung may be bitter rivals after the fallout of a $1 billion lawsuit, but the two companies have also combined for a much more lucrative 106 percent of smartphone market profits. This overshare of the third quarter worldwide smartphone revenue has Apple accounting for 59 percent of the profits and Samsung taking home 47 percent. That's a total of 106 percent, according to calculations in a report by Canaccord Genuity analyst Michael Walkley. The reason that Apple and Samsung were able to acquire 100 percent of the industry's profits is because of losses by rivals RIM, Nokia and Motorola in the same quarter. Previously, Apple and Samsung dominated the second quarter, posting a combined 108 percent of the smartphone market's revenue. The trend is set to continue in Apple and Samsung's fourth quarter, Walkley said in his report. "We believe Apple will gain smartphone share during Q4/12," he predicted. "[This is] due to strong demand for the iPhone 5, ramping supply, Apple's aggressive iPhone 5 launch plans in over 100 countries including China by Q4/12, and checks indicating solid sales of the reduced price iPhone 4S/4 models." Samsung, meanwhile, has had continued success with the Galaxy S III. The Android-powered device helped the company's industry-leading smartphone market share rise from 31.1 percent in the June quarter to 32.2 percent in the September quarter. Walkley also weighed in on Apple's growth in the tablet market. 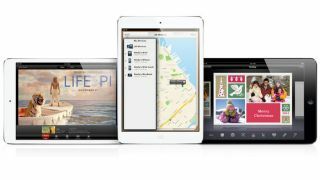 iPad just crossed 100 million devices sold in its first two and a half years on the market and he forecasted the Apple tablet line to sell 101.6 million in 2013 alone. Apple's sales may only be hampered by the fact that its 7.9-inch iPad mini could be in short supply, as it has already sold out of its initial launch stock. Customers who pre-order the WiFi model of an iPad mini online Monday face a two-week shipping wait time. Even if iPad mini does face shortages, with those kinds of numbers, Apple would control 58.4 percent of the tablet market. To put 101.6 million number into perspective, Walkley predicted that tablet rival Amazon will sell 10.7 million tablets next year. Samsung is seen as a close third with just 8.4 million tablets forecasted in the same time frame.